Walking has allowed lots of things that running doesn’t, including some enjoyable time outdoors with my husband, these past several months. Below is one shot of several that I took, when we visited the High Line park in New York, in the hours preceding the Overnight walk. Steve doesn’t presently enjoy running as I do, and we were just a few hours away from starting our 20 mile ramble, so a run around Brooklyn or on Manhattan was a downright silly idea. He does love, as I do, exploring in a big city, especially one that has evolved away from needing personally-owned automobiles. So we had a great little short morning adventure in Chelsea, which included a memorable brunch with Ben, at Cookshop. 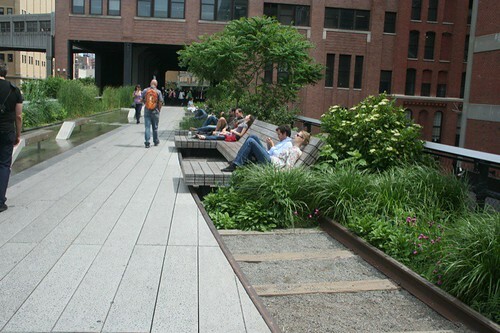 I had read about the park a few years ago, perhaps in the Smithsonian magazine: an old, mostly abandoned elevated subway section had been converted to a public green space. Our visit did not match up well with the opening of a new section on the park, but perhaps it’s just as well that the stroll was short – just eight city blocks long. We also availed ourselves of the ample (and fun, modern) seating, to stop a few times and enjoy the sunshine and colorful crowds. My camera and I also heaped worship upon the vibrant but seemingly out-of-place native plantings: for my entire life, this city (I have visited many times) has existed as such a temple of urbanity that when I think of something “native” that springs up from the ground, my mind first goes to steam rising up from a subway tunnel grate. And yet there were flowing grasses, several varieties of coneflowers and plenty of other brushy, low-maintenance but high-visual-impact (check out the explanation and lists here) plants, many of which are also native to MN. 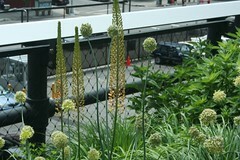 Here are all of the pictures I took on the trip, which are mostly photos taken at High Line. My athletic endeavor of the spring –the Overnight– is behind me now, and it couldn’t have come sooner. Based on some unwelcome plantar fasciitis and toe blisters, I have a theory that, for my foot health, walking on pavement for more than three miles is worse than running up to 15 miles on any surface. I’m transitioning back into doing more running than walking miles, for a few months, in prep for the Ragnar Relay, in mid-August. Stay tuned. Next ›To market, to market.